I was at the National Archives in Washington D.C. today and was excited to learn that they will be hosting a Virtual Genealogy Fair! I was disappointed when the annual NARA Genealogy Fair was cancelled last spring, but now that it is a virtual event many more people across the country will be able to participate. This will be a FREE event and if you miss the live webcasts then you can view them later as they will be archived on the National Archives YouTube page. The schedule has not yet been released (I will post it as soon as it is available), but you can mark your calendars for September 3 & 4, 2013 if you are interested in participating. 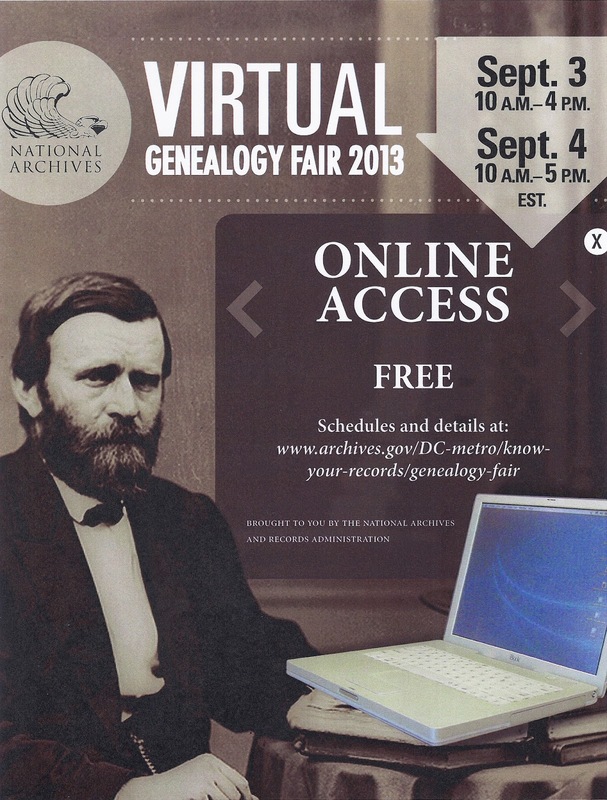 For the first time ever, the National Archives will host a virtual Genealogy Fair via webcast using the Internet. This two-day program will showcase tips and techniques for using Federal records at the National Archives for genealogy research. Lectures are designed for experienced genealogy professionals and novices alike. Lecture topics include Native American and African American history, immigration, Civil War pensions, U.S. Colored Troops, and Navy Deck logs. “Help! I’m Stuck” Call-In Consultation: National Archives staff will be available to answer research questions during the Fair. WHO: Speakers include genealogy experts from the National Archives and U.S. Citizen and Immigration Services. HOW: The National Archives will make this event available via webcast. The webcast will include options for the hearing-impaired. Recorded sessions will be available online after the event. For more information about the fair, e-mail KYR@nara.gov. 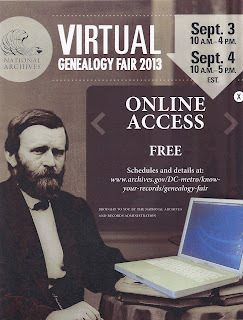 Join the Genealogy Fair conversation on Twitter using #genfair2013.